In addition to the survival of her dress, we can also glean something of her knowledge of French haute couture based on entries in her travel log or daybook. Indeed, she referred to this as her “party dress.” Her account also indicates a substantial amount of time was spent shopping not only for herself but others, including Chicagoan Mrs. Marshall Field. September 13: Arrived in Paris at noon…. Ordered Dell’s [Mrs. Arthur Caton] black dress and Arthur’s suit. September 14: To Pingat. Ordered Mrs. F’s dress [Mrs. Marshall Field], Dell’s cloak and mine. To Grange & Majantus. Ordered my bronze dress. September 16: Ordered Dell’s blue dress. 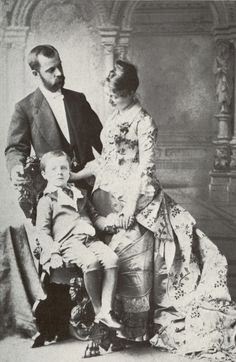 A photo of Mrs. Eddy with her husband and son, wearing her Pingat dress survives, in addition to the Healy painting. As noted by the Chicago Historical Museum: Abbie was "the wife of Augustus Newland Eddy, a manufacturer and merchant who later became a member of the Chicago Stock Exchange, she enjoyed traveling abroad and after 1900 made annual trips to Europe. 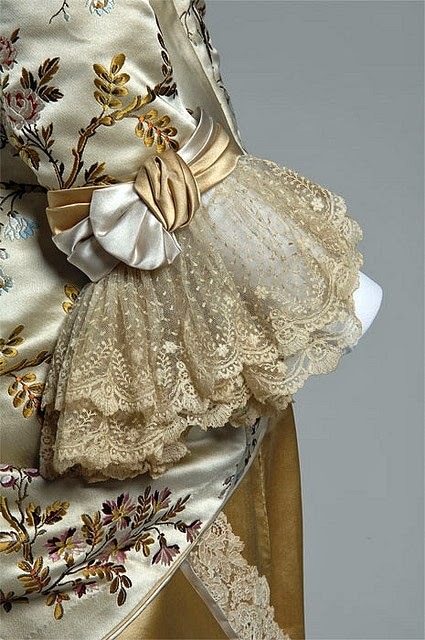 Mrs. Eddy favored French fashions and became highly knowledgeable about the dressmakers and shops in Paris. 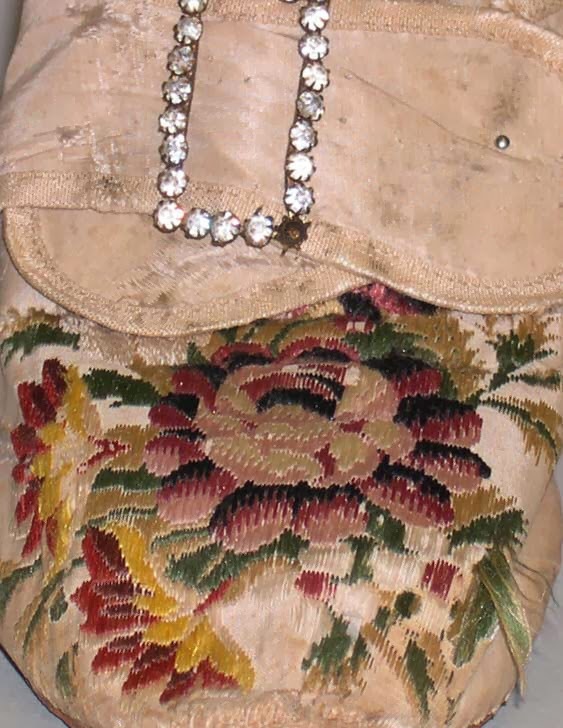 In addition to her donations of European couture, the Chicago History Museum has many of Mrs. Eddy’s journals and scrapbooks which speak of her visits to Europe’s leading houses of couture. Eventually, many of her friends turned to her for advice on where to shop while in Europe, and Mrs. Eddy would often suggest the houses of Worth, Pingat, Virot, and Doucet." 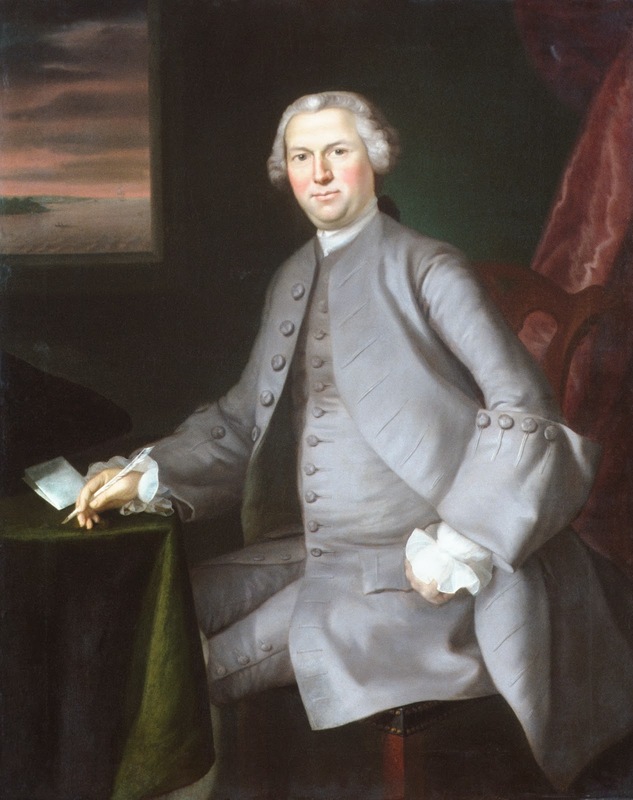 A fine, trim suit worn by Revolutionary war patriot, Samuel Cutts (1726-1801) c. 1780s, will be on view at the Saco Museum, Saco, Maine, from 14 March – 6 May 2014. The narrow cut of the blue silk coat with matching buttons reveals an elaborate silk brocade waistcoat beneath, sporting tiny brass buttons. The fabric for the coat was most likely English but cut and tailored in New England/New Hampshire, while the vest was probably pieced together from a kit. The slim cut of the breeches underscore that this was not the garb of a man involved in physical labor. The ensemble emphasized a lean silhouette with shallow pockets or artificial flaps, all serving to eliminate bulk. There are no coat skirts or extraneous material. Cutts, of Portsmouth's Committee on Safety, greeted Paul Revere at the conclusion of what is frequently considered his “other” ride at Stoodley’s Tavern in Portsmouth, New Hampshire. Revere’s ride on 13th December 1774 along the Boston Post Road was cold, icy and dark. Occurring months before his more legendary ride on April 18, 1775 Revere road to warn the citizens of New Hampshire of a potential British troop landing. With a tad more aggression, Revere's "Portsmouth Alarm" could well have ignited an earlier start to the American Revolution. The ensuing raid on Fort William and Mary by the seacoast area militia, is still considered by many as the initial strike of the battle for independence. 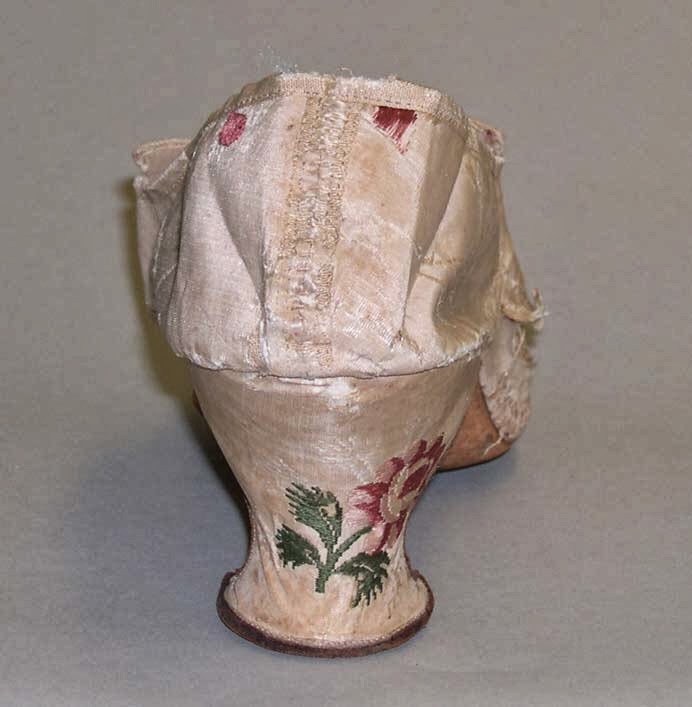 This particular shoe may have been a wedding shoe. It reflects the transition from the earlier Rococo to the Neoclassical. The smooth silk provides the perfect ground for bright floral flourishes at key visual points – toe and heel. Measuring 9 inches (22.9 com) from heel to toe, they would be roughly equivalent to a women’s size 6.5 (USA), 4.5 (UK) or 37 (EUR) today. In other words, these could be worn today. 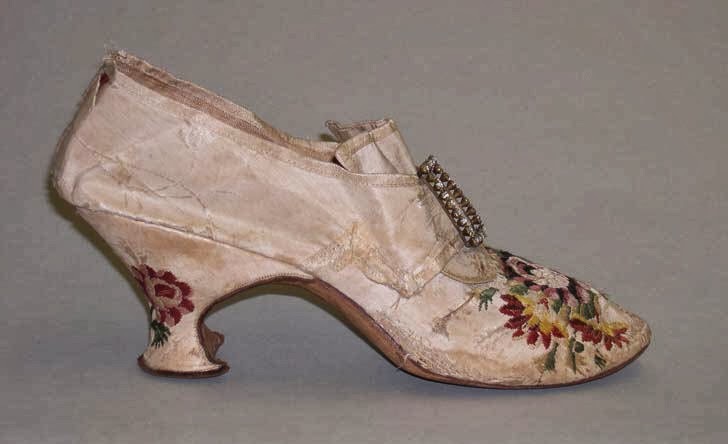 When I look at the shoe, I imagine the pair as they were originally, but a close look will reveal a fragile state: in several places, the silk is abraded and shattered, and threads are unraveling. If you look closely at the downturned tongue in the third image, you will note many small pinholes resulting from the use of buckles. James Davis and Thomas Ridout, affixed labels to their shoes by the mid-18th century. The label notes that the shop location was near Aldgate, located within the heart of the Ward of the Cordwainer. Indeed, Ridout and Davis were probably at the height of their production, when, in 1763, the late Medieval Aldgate was taken down. as well as other institutions in Maine and New Hampshire. 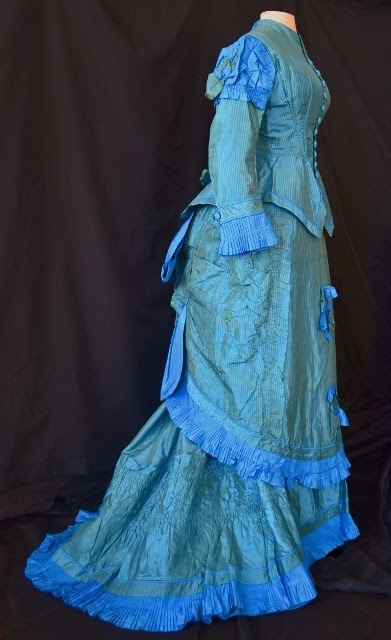 An exhibition of over 50 costumes will focus on the clothing worn by the inhabitants of northern New England from the 18th through the 20th centuries. 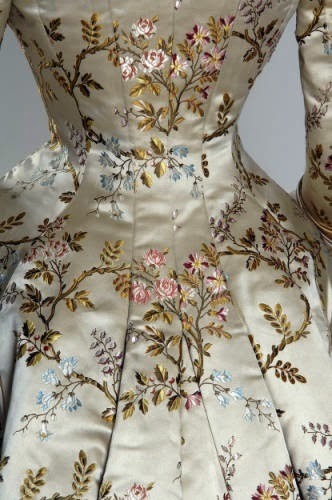 It will include not only examples of "best" dress, but also items of everyday clothing. 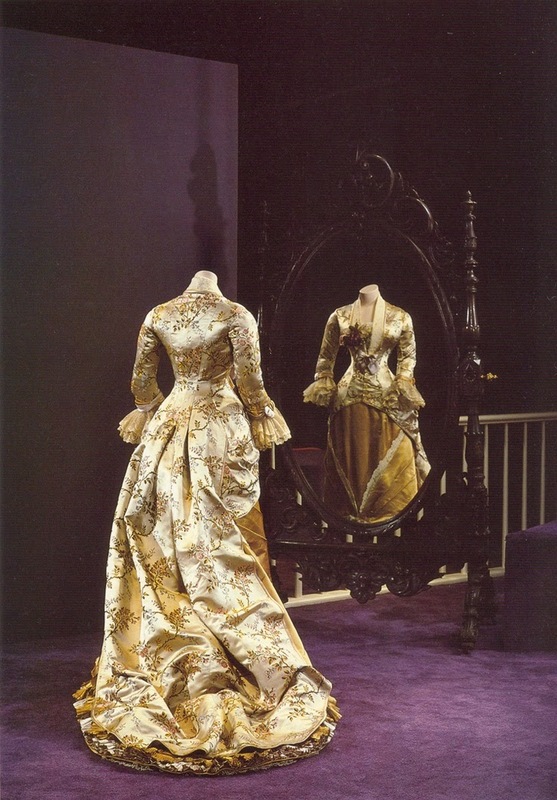 Fashionable attire was not confined to just special occasion garments or the clothing of the elite; even ordinary clothes reflected the current style of their day. In addition to outerwear such as 18th-century cloaks, ladies' gowns of the 19th century, and 20th-century men's suits and military uniforms, there were be a wide variety of accessories on view as well.